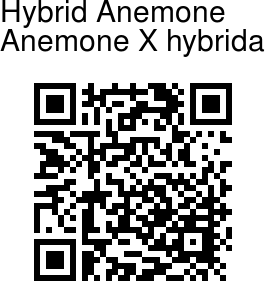 Hybrid Anemone is an erect perennial herb, with stems 0.5-1.5 m long, and a woody rootstock. There are about 30 cultivars of A. X hybrida, but only a few are common in the trade. 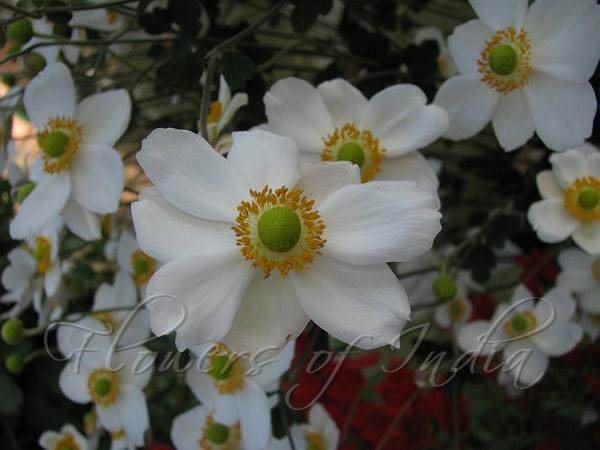 One of the most popular is ‘Honorine Jobert' with large, pristine white flowers on stems over 1 m tall. ‘Andrea Atkinson' is quite similar but shorter, about 75-90 cm. Sepals (which look like petals) are 5-20, white. Stamens are 4-6 mm long, with threadlike filaments and ellipsoid anthers. Pistils are more than 180, long stipitate, about 1.5 mm. Ovary is velvety, stigma rectangular. Flowering: July-October. Photographed at Shalimar Garden, Srinagar.